Nigeria international Oghenekaro Etebo says he made the right decision in joining English Championship side Stoke City despite interest from top German and French clubs. Etebo, 23, joined the Potters on a five-year deal from Portuguese outfit Feirense, barely a week before the start of the 2018 World Cup in Russia. The move came as a surprise as the midfielder had impressed on loan at La Liga side Las Palmas, and was expected to use the World Cup as a chance to showcase his talent. 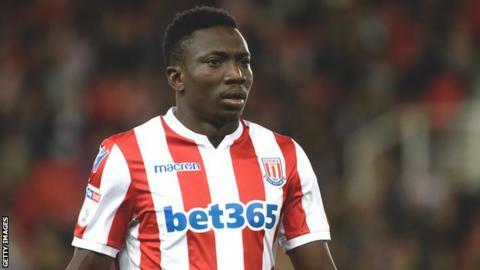 “Many people close to me and some of my friends expressed their disappointment, but I have no regrets joining Stoke City,” Etebo told BBC Sport. “They all felt I could’ve waited until after the World Cup before making a decision. The fact that I received interesting offers from France, Germany and even Spain got them more upset. Stoke City, relegated from the Premier League at the end of last season, occupy 13th place in the English Championship table, nine points outside the play-off places. Despite a personal admission of trying to adapt to life in the English second-tier, Etebo says he is relishing the challenges that comes with playing in the West Midlands. “People back home always say the Premier League is hard but the Championship is a tough and demanding league to play in,” he added. “You could play almost 65 matches in a season, if you include the Cup and play-off games as well. How is that any easier when you still go out to play international football for your country, too? Etebo made his international debut for Nigeria in March 2016 and has won 19 caps, scoring once for the three-time African champions. Named Caf’s most promising talent for 2015, Etebo was top scorer as Nigeria won the 2015 African U-23 championship and also scored four goals to help his country clinch bronze at the 2016 Rio Olympics football.